This Tudor-revival bed and breakfast located in Red Wing, Minnesota, took Red Wing Shoes’ President J.R. Sweasy two years to build (1932-1934), and he spared no detail. It reflects his eye for quality and is beautifully appointed with woods such as walnut, oak, cherry and maple. Each suite features a private bath, and all have double whirlpools and/or fireplaces. Common areas abound; the outdoor patio with stone fireplace is the ultimate in relaxation. Our B&B is situated just blocks from the Mississippi River and is less than an hour drive from Minneapolis, St. Paul and Rochester, MN. Rooms: 4 suites, 1 standard Rates: $99-$225 Breakfast: Full, plus early a.m. coffee/tea, evening refreshments Payment: AE, MC, V, D, Travelers checks, personal check. 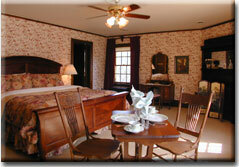 This and other Minnesota Bed and Breakfast Inns can be found here online in The Register.